To compare a faster, new, high-resolution accelerated 3D-fast-spin-echo (3D-FSE) acquisition sequence (CS-SPACE) to traditional 2D and high-resolution 3D sequences for knee 3-T magnetic resonance imaging (MRI). Twenty patients received knee MRIs that included routine 2D (T1, PD ± FS, T2-FS; 0.5 × 0.5 × 3 mm3; ∼10 min), traditional 3D FSE (SPACE-PD-FS; 0.5 × 0.5 × 0.5 mm3; ∼7.5 min), and accelerated 3D-FSE prototype (CS-SPACE-PD-FS; 0.5 × 0.5 × 0.5 mm3; ∼5 min) acquisitions on a 3-T MRI system (Siemens MAGNETOM Skyra). 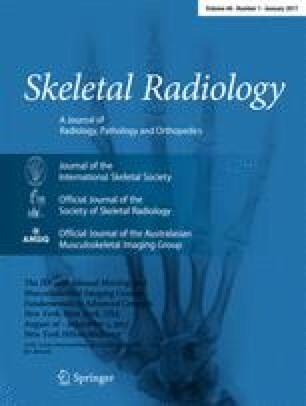 Three musculoskeletal radiologists (MSKRs) prospectively and independently reviewed the studies with graded surveys comparing image and diagnostic quality. Tissue-specific signal-to-noise ratios (SNR) and contrast-to-noise ratios (CNR) were also compared. MSKR-perceived diagnostic quality of cartilage was significantly higher for CS-SPACE than for SPACE and 2D sequences (p < 0.001). Assessment of diagnostic quality of menisci and synovial fluid was higher for CS-SPACE than for SPACE (p < 0.001). CS-SPACE was not significantly different from SPACE but had lower assessments than 2D sequences for evaluation of bones, ligaments, muscles, and fat (p ≤ 0.004). 3D sequences had higher spatial resolution, but lower overall assessed contrast (p < 0.001). Overall image quality from CS-SPACE was assessed as higher than SPACE (p = 0.007), but lower than 2D sequences (p < 0.001). Compared to SPACE, CS-SPACE had higher fluid SNR and CNR against all other tissues (all p < 0.001). The CS-SPACE prototype allows for faster isotropic acquisitions of knee MRIs over currently used protocols. High fluid-to-cartilage CNR and higher spatial resolution over routine 2D sequences may present a valuable role for CS-SPACE in the evaluation of cartilage and menisci. We would like to acknowledge Bruce Spottiswoode, PhD, and Ke Cheng Liu, PhD, from Siemens for their role in applying the CS-SPACE sequence and setting up the sequence on the institutional MRI scanner. We would also like to acknowledge Dipl-Inf Christoph Forman from Siemens Healthcare GmbH and Jens Wetzl, MSc from the Department of Computer Science of Friedrich-Alexander-University Erlangen-Nuremburg, Germany for their important role in developing the CS-SPACE reconstruction framework. This research study was not sponsored financially by any institution. Dr. Raithel is employed by Siemens Healthcare GmbH (Erlangen, Germany). Her contribution to the paper was limited to development of the accelerated sequence and elucidation of the technical factors and descriptive language of the MRI sequences. The study design, data acquisition, data analysis, and interpretation were performed entirely by the remaining authors, who declare that they have no conflicts of interest.